DO YOU HAVE A MICRO-MOMENT? 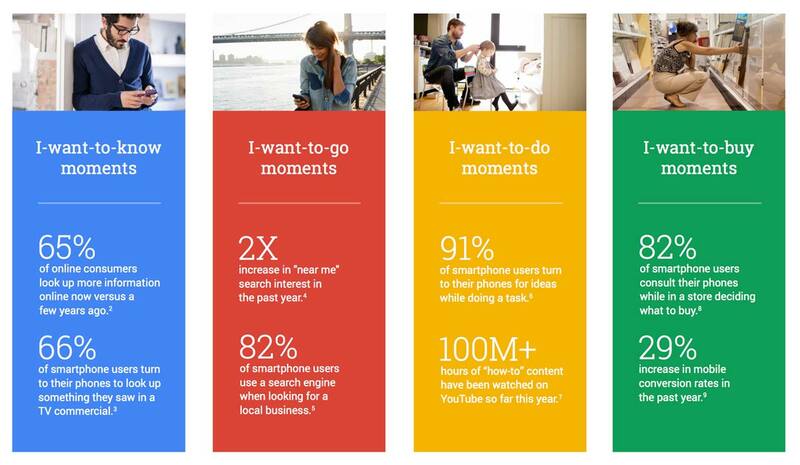 According to Google, our online habits are shifting again. Our ‘online existence is becoming increasingly fragmented’ they say. The thought is that because we have devices that can get us online anywhere at anytime, we are now grabbing ‘micro-moments’ of online experience. Sounds awesome! Anyway, the point is, if this is increasingly the way people are seeking to interact online, we all have to make sure that we are providing a smooth and immediate experience. If you’re placing barriers in the way, like making your customers have to pinch and expand and squint and lose their place, by not having a mobile friendly site, you’re asking for trouble. If it takes customers too long to get the information you need, they’ll move on. There’s bound to be another website that gets it. It’s all about the user experience now. The more personalised you can make your online presence and the more focused it is on a brilliant user experience, the better. According to Google’s VP of Product Management, Jonathan Alferness, “As we evolve we’re going to get to the point where I understand you and what your needs are well enough that I can give you the answers to the question before you even ask it.” This is all in an effort to “evolve the digital advertising ecosystem” through the “massive shift” Alferness said is occurring in mobile. We’ve said it a lot in our blogs but if you don’t think you need to be optimized for mobile, you’re going to be losing out on potential customers sooner than you think. But, it’s more than just being mobile friendly. It is all about the user experience. You’ve only got a micro-moment to get that right!